It’s finally here! The Toronto International Film Festival is one of the busiest times of year for us at #DoTheDaniel, and this year I am taking lead on the majority of our coverage while Catherine heads out of town for an exciting #DTDtravels adventure. While I usually would sit here and tell you all about the star-studded premieres we are most excited about, this year I wanted to take a bit of a different perspective. 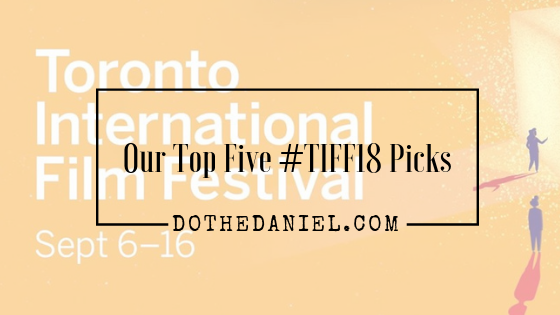 I wanted to share the hidden gems of #TIFF18 and hope that the films we have chosen to attend and enjoy inspire you to curate your own experience to see the best of what TIFF has to offer during the festival! I actually love getting nostalgic and re-reading our content from the years attending screenings and TIFF events – click here to see some of our favourites – so it should come as no surprise that my list of must-see hidden gems are films that will hopefully inspire you and make you feel. The power of cinema is in the story teller’s ability to convey something bigger than us – something that speaks to the core of the viewer. Whether that is with a compelling story, or with stunning visuals, I like to believe that I get a little wiser with every TIFF season. Not only as a member of the media (learning where to give my attention and love, and where not to) but also as a huge fan and TIFF member. Without further ado, allow me to share my five films you simply must see this season. Four of which are of course those hidden gems that might just surprise you in ways you weren’t expecting – and the fifth being a shinning diamond of emotional turmoil and musicality that is sure to make you cry. Lately I have been immersing myself more into the LGBTQ community as a whole. Not only volunteering back in my personal life here in Toronto to those individuals that need it most, I think it is important to celebrate the advancements that the LGBTQ film industry has had over the last decade. Growing up, an unsure of myself, I would have benefited from watching powerful stories of human emotion, love, and the challenges that Rafiki tackles. Though of course distinctly unique to the Kenyan experiences of the two lead characters, I still identify with this film already and know it will bring me to tears. The tenderness of this story makes it my number one film you need to see this year – my first choice for hidden gems that will change you for the better. Everything about this film makes me smile. The satire, the way it’s shot, and the fact that film has the ability to shine a light on how ridiculous real life can be. Not to mention the fact that listening to a man speak Spanish or Italian to me drives me wild, this is a hidden gem because it showcases the power and freedom that film holds in our world. Considering the current political climate, I’d say we all could use a little satire, wouldn’t you? I think what drew me most to this film was the idea that I remember being sixteen as difficult enough. Let alone being drawn into the underbelly of the world of smuggling like PeiPei does and the intensity that her journey will take us on. I love watching foreign films and this one definitely has me wondering what will happen to our heroine on her path. Consider my curiosity peaked! I have had a crush on this actor for as long as I can remember, I adore all things Mexico, and this story is just incredibly captivating. Plus in my opinion, the world of Mexican cinema deserves to have the world paying attention. Aside from a gripping story, it showcases some of the best qualities of Mexico. We’ll have to ask Pepe what he thinks of the trailer! I don’t know how else to express how much this makes me feel. Maybe it’s the idea of love gone wrong, or star crossed lovers. Maybe it’s Lady Gaga stripped down to her most raw and singing songs that I am already trying to download, this is going to be a huge blockbuster hit. So is it a hidden gem, no. But is the story a hidden gem that lays within us all? Absolutely. My heart is both full and aching at what this will evoke in me sitting in the theatre. And isn’t that what cinema is meant to do? A story of losing yourself and the things you love most. A story of the road towards something new. A story of love and how sometimes it conquers all, and sometimes it does not. This cannot speak more to me a music and film lover. Whatever your #TIFF18 experience entails this year, I hope that these films help to show you the power of the festival and it’s ability to bring together some of the best and most talented film makers and actors. From the celebrity names that will be said and shared over and over again, to the rising stars that will shape film starting with their first appearances this year, I hope I have helped to inspire you. Because after all, that is what The Toronto International Film Festival is all about. Make sure to share your favourite screening and moments by following @TIFF_NET on Twitter an Instagram. Use and follow #TIFF18 and remember to enjoy the power of cinema at it’s finest, in the city that has helped to make it something so incredibly beautiful.